This week the Share MI Roads safety pledge reached 1,000 signatures. Thank you Autumn Mahoney for being our 1,000th pledge signer. And a heartfelt thank you to everyone who has signed and shared the pledge making a personal commitment to help make Michigan roadways safer and more comfortable for all users. Please help us reach our next milestone by sharing the pledge with your friends and family. Visit our promotional toolkit page to download "I Took the Pledge" Facebook banners and find sample tweets and other resources to help spread the word. Twenty-three states and the District of Columbia have safe passing laws that require motorists, when passing bicyclists, to leave a specified distance between the car and the cyclist. Additionally, nineteen states have "general passing laws," which specifically require vehicles to pass bicyclists at a safe distance and speed, but do not provide a specific minimum distance. Currently, State Representative Peter Pettalia is working to draft a safe passing legislative bill package in the House. Michigan is one of only seven states that have not enacted any type of law requiring motorists to pass bicyclists safely. The Michigan Vehicle Code currently states, "The driver of a vehicle overtaking another vehicle proceeding in the same direction shall pass at a safe distance to the left of that vehicle, and when safely clear of the overtaken vehicle, shall take up a position as near the right-hand edge of the main traveled portion of the highway as is practicable." Since a bicycle is not considered a "vehicle" in Michigan, but rather a bicyclist has "all the rights and is subject to all of the duties applicable to the driver of a vehicle," it is left to interpretation if bicyclists are actually protected under current standards. Regardless, the current "safe distance" language is difficult for the average motorist to understand and even more difficult for law enforcement to enforce. "Safe distance" is often a matter of perspective. To a motorist, "safe distance" often means simply avoiding contact with a cyclist, especially since this subject is rarely covered in driver's education. For law enforcement, the current "safe distance" language is difficult to enforce and provides no clearly articulable standard that patrol officers can use to educate motorists or cyclists. Michigan bicyclists face significant risks from motorists passing too closely, even when riding as far to the right in accordance with state law. Motorists who pass too closely can startle bicyclists, causing them to lose control; large vehicles produce strong air currents that can knock cyclists off course; and motorists often overestimate the distance between themselves and bicyclists, which can lead to direct impacts. One of the most common type of bicycle/auto crashes involve collisions where a motor vehicle strikes a bicyclist while attempting to pass when traveling in the same direction. The Office of Highway Safety Planning reports that 60% of bicyclists involved in crashes were "going strait ahead" prior to the crash. Michigan bicyclists commonly complain that drivers pass dangerously close, but in fairness, many motorists are unaware of the dangers posed by their actions. Others, sadly, pass closely to intentionally intimidate or harass bicyclists. A five-foot passing law will delineate the legal standard for "safe distance" and provide clear guidance to motorists, bicyclists, and law enforcement, alleviating confusion and frustration. A five-foot standard is supported by both the Michigan Department of Transportation and Michigan Department of State who recently published a joint PSA recommending drivers pass bicyclists with five feet of clearance. Volunteers have been busy setting up share the road pledge stations at various events across Michigan over the past few months. In march we collected over 200 signatures alone at Detroit Bike City at the Cobo Center. Additionally, General Motors announced that it will work with the Crim Fitness Foundation throughout 2014 to help educate the community on how to share the roads with motorists and bicyclists to ensure that Genesee County roads are safe for all by encouraging residents to take the pledge! Crim Fitness Foundation also partnered with Trans4M to host a pledge station on the Capitol Lawn during the Lucinda Means Bicycle Advocacy Day held on May 21st. During the event numerous State Legislators, staff, and other state workers took the pledge to share the road. Top: State Representative Anthony Forlini takes the share the road pledge on Bicycle Advocacy Day at the State Capitol on May 21st. We are pleased to report that on May 29th, the League of Michigan Bicyclists received a 2014 DALMAC Fund grant from the Tri-County Bicycle Association (TCBA) for the Share MI Roads campaign. The $9,000 grant will support efforts to develop toolkit resources for driver's education instructors to use to emphasize bicycle awareness to new drivers across Michigan. Due to time constraints within Michigan's existing drivers education curriculum, young drivers currently receive limited training on how to safely share the road with bicyclists. Michigan's curriculum leaves 1.5 hours of classroom training up to the discretion of the instructor, providing opportunities to expand upon these issues. Our toolkit will focus on common misconceptions and crash scenarios between motorists and bicyclists and provide supplemental resources for instructors to use in the classroom, especially during the portion left to their discretion. The growing number of drivers who opt out of taking formal drivers education training after turning 18 will also find these materials beneficial. Our sincere appreciation to TCBA for providing funding to help jump start this important education and outreach effort! We'll need additional financial support from individual supporters like you, however, to ensure we have the resources needed to create and distribute these new materials to all 340 driver's education facilities across Michigan. Please help us further leverage this generous grant funding by making a personal donation to the Share MI Roads campaign to help us expand our efforts to improve driver's education in Michigan. Above: LMB Advocacy and Policy Director John Lindenmayer accepts a DALMAC Fund grant from TCBA Treasurer Steve Leiby. Statewide work zone crash statistics released today by the Michigan Department of Transportation (MDOT) in observance of National Work Zone Awareness Week suggest an alarming trend: the number of serious injuries in Michigan work zones went up from 57 in 2012 to 107 in 2013, even while the number of overall crashes declined. MDOT said there were 4,080 crashes, 1,112 injuries, and 10 fatalities in Michigan work zones in 2013, as compared to 4,592 crashes, 1,181 injuries, and 15 fatalities the year before. Work zone crashes in Michigan resulted in motorists, bicyclists and pedestrians being killed. While there were worker fatalities in 2013, none involved motor vehicles. been more alert behind the wheel." The Michigan State Police (MSP) and the Michigan Infrastructure and Transportation Association (MITA) are joining MDOT in reminding motorists to always drive carefully in construction work zones on state and local roads. "The Michigan State Police is pleased to once again partner with MDOT to help raise awareness and create a safe environment for workers and motorists in work zones,” said Col. Kriste Kibbey Etue, MSP director. "Enforcement is not enough; motorists must slow down, be alert and stay attentive as they drive through work zones." "We have been all over the state training road construction workers on safe work habits," said Rob Coppersmith, vice president of membership services for MITA. "But the one thing we can't control is driver behavior. We are asking anyone who drives in construction zones to exercise caution, and put down their cell phones so that road construction workers can go home to their families at the end of the day." National Work Zone Awareness Week, April 7-11, is observed across the country. 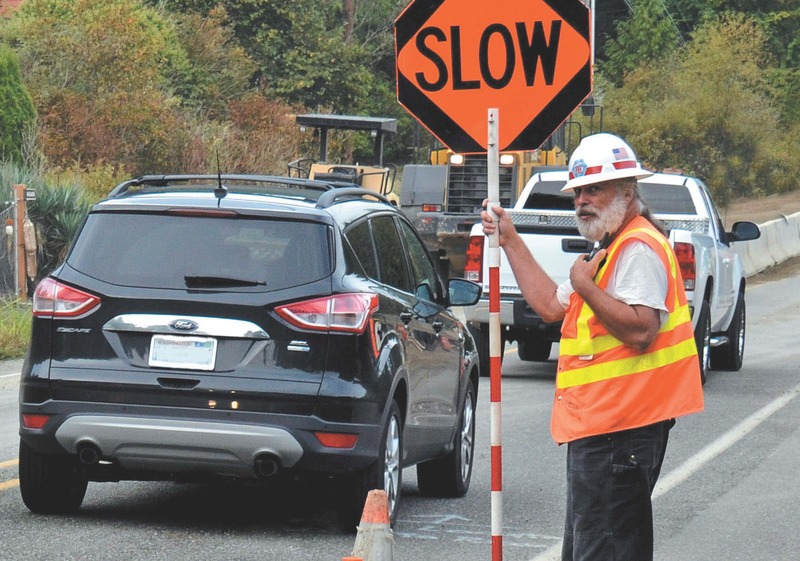 To raise awareness, the American Association of State Highway and Transportation Officials (AASHTO) has released a public service announcement (PSA) to remind drivers to slow down and look out for workers and lower speed limits in construction work zones. The PSA is available on YouTube. For more information about work zone safety, visit MDOT's website at: www.michigan.gov/workzonesafety. Campaign Kickoff: Introducing Share MI Roads!